Product Testimonials with photos for the Esox Cobra Jigs & Esox Cobra MAGNUM Musky Jig. If you have a Bait Rigs product testimonial that you would like displayed here, please to go to our Contact Page we will review it for posting. If we post your story we will give you a $10 product credit. Products affected: Esox Cobra Jigs, Esox Cobra MAGNUM Musky Jig, Cobra Tails, Cobra Shads and Esox Cobra Jig Kits. 2006 - 1st place WMT Pelican Lake, WI. The reason we prefer the Esox Cobra Jig is that it swims great, falls slowly and whether I use a Cobra Shad tail or Cobra Reaper tail, the swimmer head always keeps the bait running true in the water, making it more visible and life like. Additionally, the big bite Mustad Ultra-Point hook SETS and HOLDS fish better than any jig I've ever used. Tournament our winning bait was a 6" Esox Cobra Shadtail. The presentation we used to win the tournament was to hop and swim the Cobra Shadtail along the weed edge in about 10-12ft of water. bottom , in a start and stop painfully slow presentation. It was the only thing that worked and it got us in the money with a 4th Place finish. 2006 - 1st place WMT Rice Lake, WI. We prefer the Esox Cobra Tails because they penetrate weeds better than any jig bait out there. Without a weedguard, the slippery profile of the Cobra can rip right through weeds and even milfoil, without bringing any weeds back to the boat. We like the exposed high performance Mustad hook to maximize hook sets. The hooking power of the Cobra is superior to any Jig we've ever used and once hooked up, we know that fish is coming to the boat. We got a tip from local Bass fisherman that Muskies were working bait fish in the milfoil right along with the Bass. Patterns on the weed edge and other structure were not producing, so we decide to go inside the milfoil. Nothing, and I mean nothing would penetrate the milfoil except the Esox Cobra tails. Muskies were not taking large baits so we used the 6", 3/4 oz Cobra tail Grub in the Firetiger color and ripped the bait right through the thickest part of the milfoil. We were the only guys working this pattern as everyone else had given up because they were getting snagged in the milfoil. The Cobra Tail Grubs were our little secret and we took (2) 43 1/2 inch fish out of the thickest part of the milfoil to win the tournament. 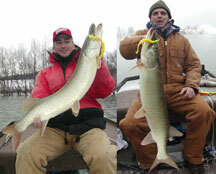 "Bait Rigs offers the finest muskie fishing jigs that I've used. The swimmer head design makes them perfect for pairing with swimming style soft plastics like paddle tail shads. They glide through the water with the look of an injured baitfish to trigger violent strikes. When jigging for big, aggressive muskie in and around heavy cover, the weedless Esox Cobra MAGNUM Musky Jigs get the nod, while the smaller open hook Esox Cobra Jigs are better for fishing cold fronts and heavy pressure situations when downsized baits rule. The large single hooks offer great hooking and holding advantages meaning more fish in the boat. These premium muskie jigs can also be used for pike, largemouth bass, stripers and other big predators. Esox Cobras and Esox Cobra Magnums are the choice of jigs for serious big game anglers." "The Esox Cobra® is my go to Muskie jig and Cobra's have contributed significantly to my success as a professional Muskie angler. I use Cobra Tail Shads and Grubs including the new Cobra MAGNUM Series . One of my favorite jig bites occurs in the spring when Muskies are cruising in the shallows. The Cobra's swim and standup on bottom better then any other jig head out there and the Mustad® Ultra-Point hook provides the positive hook set I need to bring fish to the boat. In Summer and Fall I also use the Cobra MAGNUM 9" Shadtail. The MAGNUM Shadtails are a great swim bait in the weeds and for casting or trolling in open water. I especially like the hooking power of the big bite 8/0 Mustad Ultra-Point hook and adjustable Trailer System." December 16 th on the Allegheny River, in about 22 feet of water my client and I slow trolled up and down the river. The Muskies where laying on the bottom so we wanted to keep our presentation just above them. We fished the Bait Rigs - 9 in. MAGNUM Cobra Tail Shad in Black Pearl color with a trailer hook. The Esox Cobra MAGNUM Musky Jigs are great for muskies & pike in heavy cover. They are the most snag resistant big game jigs I've fished. The angles on the front of the head allows the bait to deflect well off of hard cover objects and the large fiber hook guard does a great job of keeping the bait free of weeds. I particularly like to pair them up with a paddle tail shad and work them with a fast retrieve and jerks of the rod tip. They've performed well in all kinds of waters. Guiding for muskies on my home waters of Kinkaid Lake in the gorgeous Shawnee National Forest of southern Illinois, to chasing arctic pike on waters like North Knife in the vast and seemingly untamed wilderness of northern Manitoba, I don't head out on the water without a full assortment of jigs from Bait Rigs. Donny Nemer - Eagan, Mn. Just a word of thanks to you all. Thank YOU!!! We were using the black and firetiger Esox Cobra Jig for early spring deadbait presentation at Kevin Geary's new lodge on Nungessor lake NE of Red Lake Ontario and it was working like CRAZY!! We had numerous 40 plus inch pike and we had a 50 that broke our leader!! The Firetiger really out did everything else. I can tell you it was a thrill to see my boy land two 20 lb pike and he is only 11 years old. The second picture is my partners son Joel Nathanson he caught a 43 and 45 inch pike also using the Esox Cobra Jigs in a dead bait presentation. 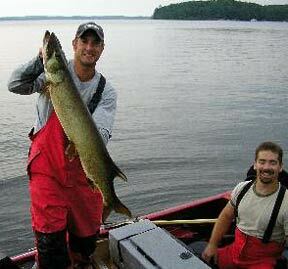 This fish, a 48 inch muskie was spotted cruzing the shallows adjacent to a shallow bay. We used the Bait Rigs Tackle 1/2 oz Firetiger Cobra Tail and pitched it ahead of the fish and pulled slowly in front to trigger a strike. The 3/8 and 1/2 oz. 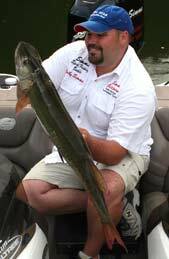 Cobra Tail is the perfect shallow water bait for sight fishing Muskies. In Febuary with 34 degree water and even colder air temp of 15 degrees. 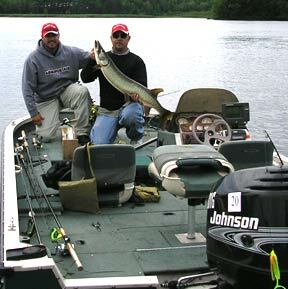 We fished the Bait Rigs - 8" Reaper Tail on an Esox Cobra Jig head and caught five Muskies from 42"- 49". The fish were grouped up and feeding on shad . We trolled the Reapers up and down stream, all the fish were right on the bottom. Muskies can't stand the Cobra's tantalizing action at any water temperature, but especially in cold water, or cold front conditions the Cobra and Reaper combo won't fail. 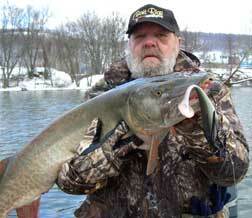 Cobra's and Reapers are a great combination for cold water muskies. 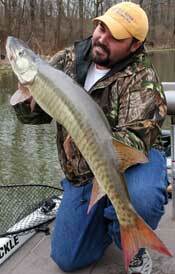 Jigs and soft bodied plastic baits are a hot concept for Muskies. In situations where finesse techniques are required or fish are holding in cover, I prefer the Esox Cobra Jig rigged with a Reaper Tail. The weed resistant Cobra Jig, with its concave head, gives the Reaper Tail and other bodies a unique wide wobble, strike-triggering action. Esox Cobra Jigs feature a Mustad Ultra-Point 5/0 big bite hook and can also be used effectively with Lizards, Creatures, Grub tails and other large plastic bodies. Be sure to utilize Jig and plastic combinations under cold front conditions, as a substitute for live bait, in weeds, or as an effective throw back bait behind artificial bait presentations. Jigs and plastics are widely under utilized and should be a part of every serious Muskie Hunter's arsenal. Professional Muskie Guide Rob Manthei of St. Germain Wisconsin guides a father and son to a super catch of 4 legal Muskies in one day. According to Rob all 4 fish were caught in the shallows adjacent to spring spawning sights using Esox Cobra Jigs in combination with 8" Reaper Tails. 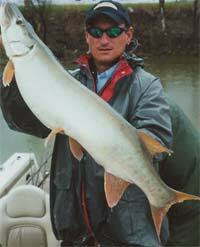 Sight fishing Muskies in the shallows is exciting action as you watch the fish attack the bait cast in front of them. Rob prefers the Esox Cobra Jig for it's swimming action and stand-up posture on the bottom. All fish were photographed and released.